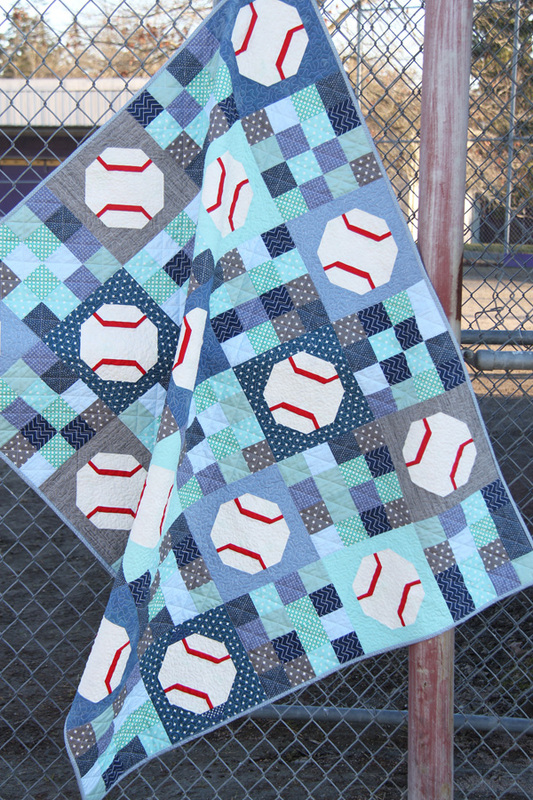 You know what I love more than every sport combined (besides sewing…obviously I consider that a sport)? Tennis. In my mind I’m really good at tennis…but in reality I’m pretty “meh” at tennis. Even though my skills are seriously lacking it’s been one of my favorite sports since high school. 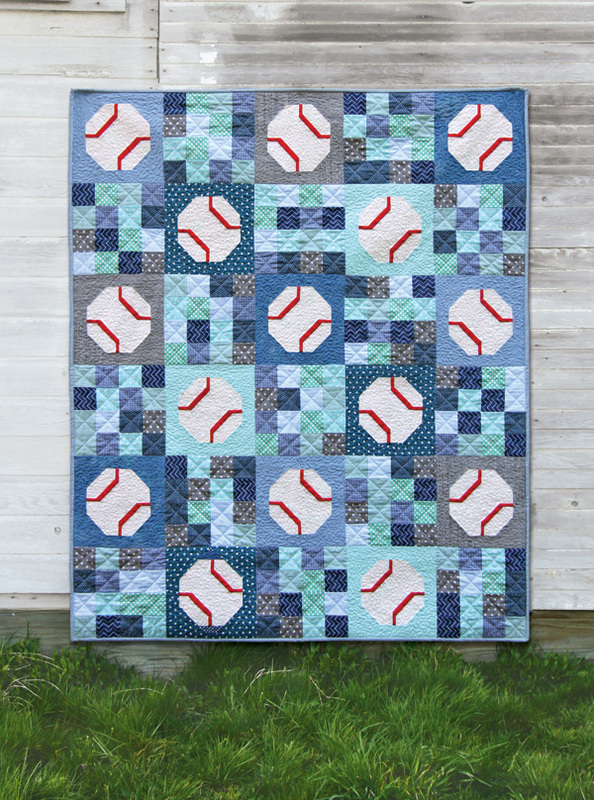 The best part about the Batter Up pattern I shared last week (thank you for all the kind comments about it!) 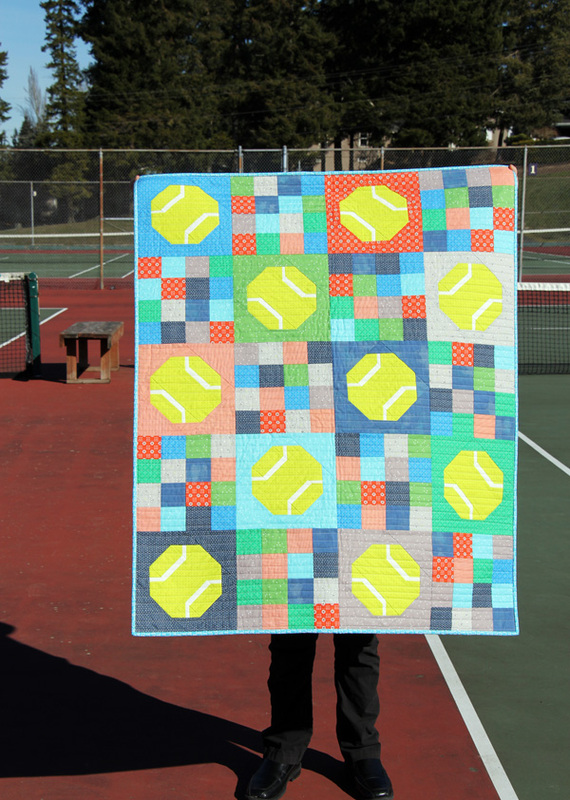 is that it can double as a tennis quilt. 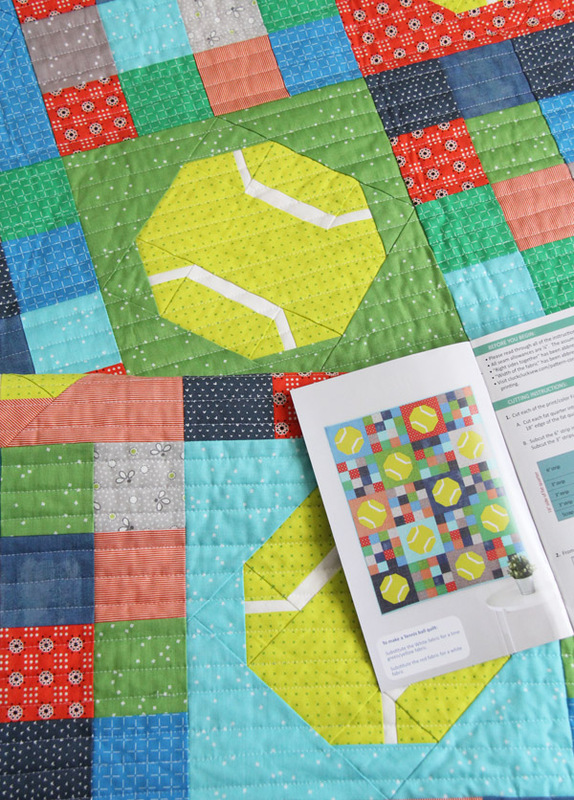 To make this pattern into a tennis quilt, all you do is swap the white fabric out for lime green (or is it yellow?!) and the red fabric out for white. 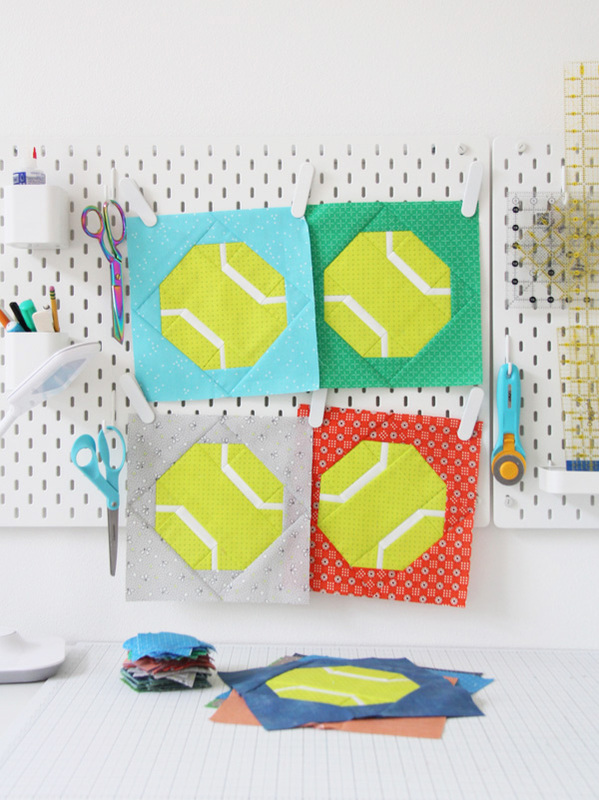 The fabric I used for the tennis balls is called Add it Up in Glow by Cotton and Steel. 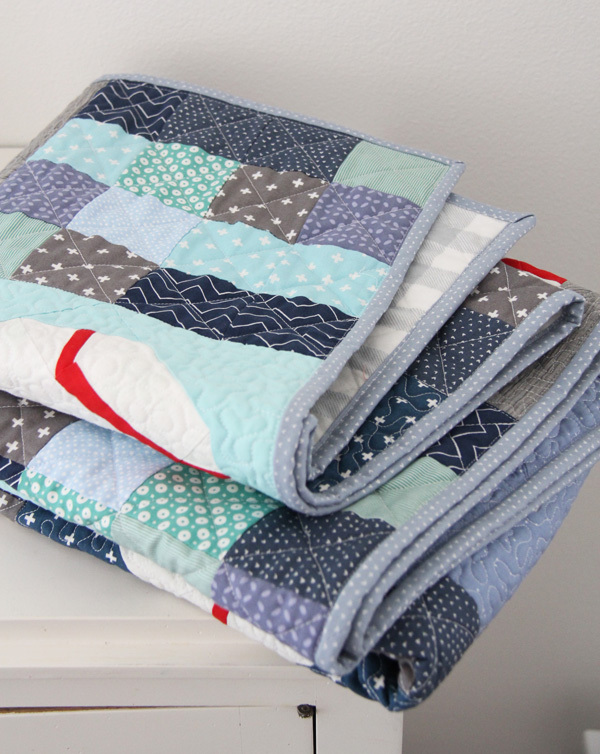 For the rest of the quilt I used some fabrics from my stash, prints from my Bounce fabric line (which is in a lot of shops now! ), and a few of these Blossom basics. I’ve been using those non-stop and loving them. 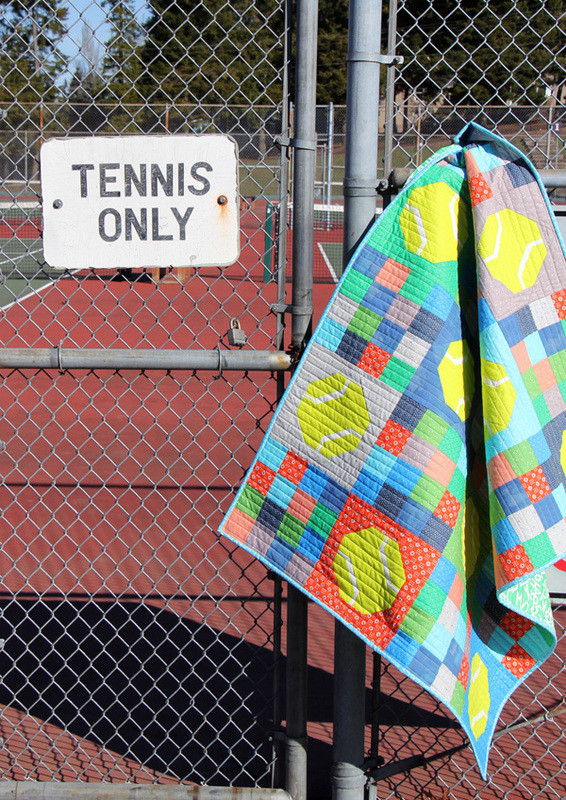 This is the crib size quilt, and my 11 year old was a good sport for making a stop at the tennis court on the way home from church so I could snap this picture. It looks sunny and warm but it was FREEZING! I’m ready for warmer weather. 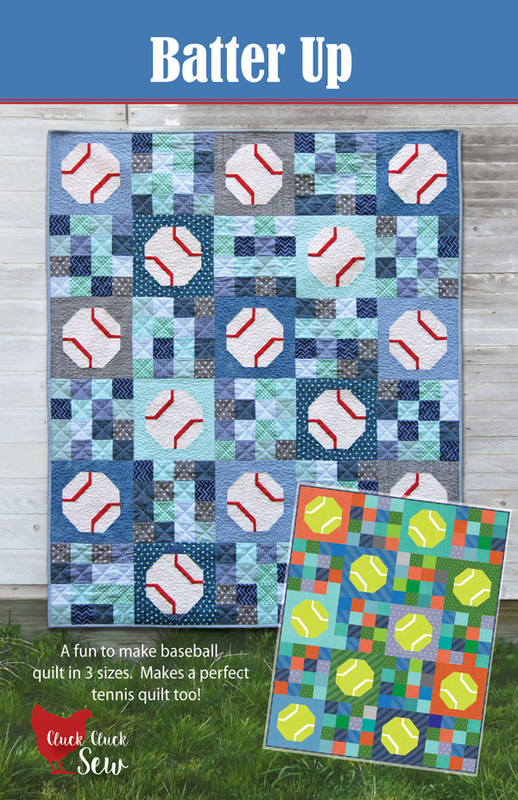 The Batter Up pattern can be found here as a PDF, or here as a paper pattern. 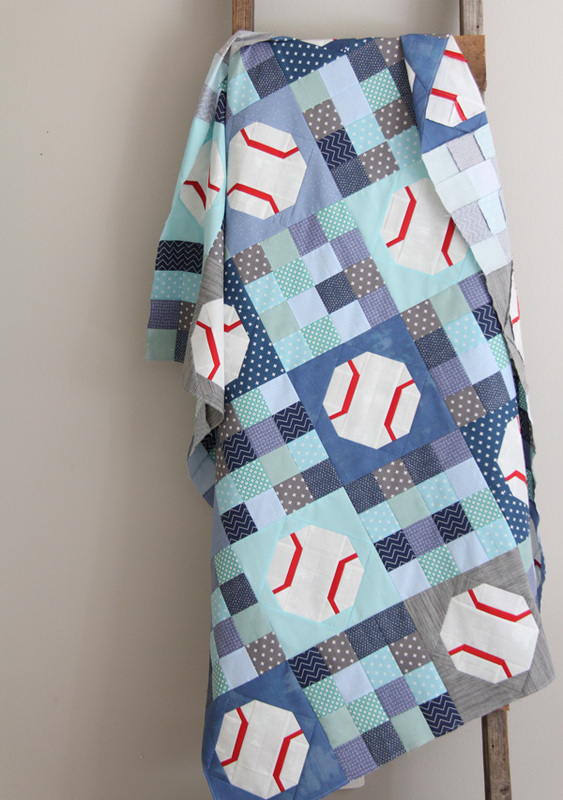 After making a football quilt and a basketball quilt, baseball had to be next! 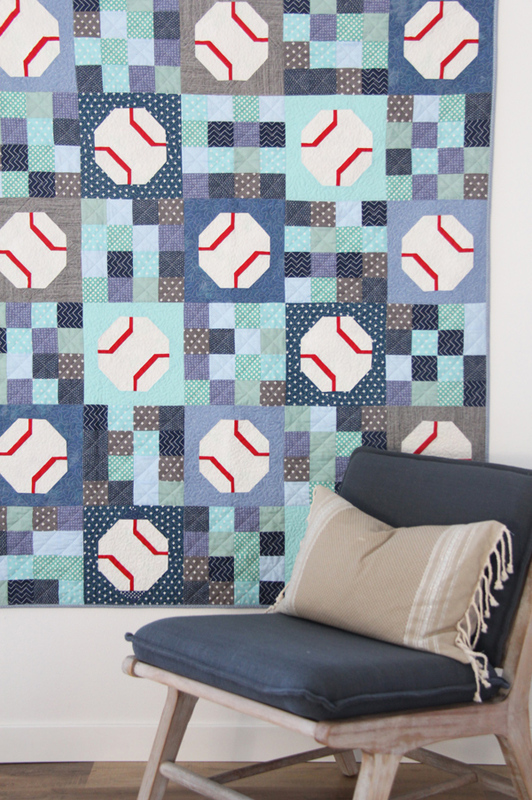 We are a baseball loving family. My kids love playing baseball, and I love the soft pretzels from the concessions stand…so it’s a win win. 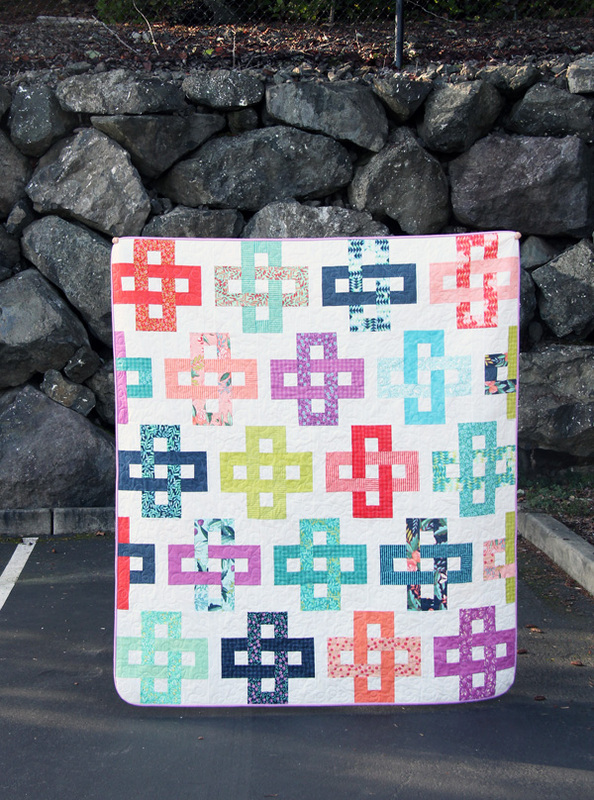 I actually made this quilt so long ago! 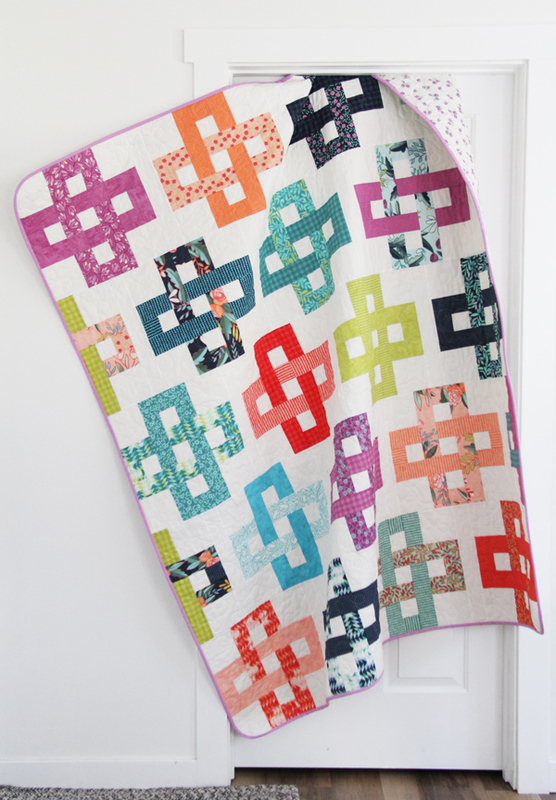 I made it, then I flip flopped on how I wanted to do the fabric requirements and blocks in the pattern…so I put it on the back burner until I could look at it with fresh eyes. 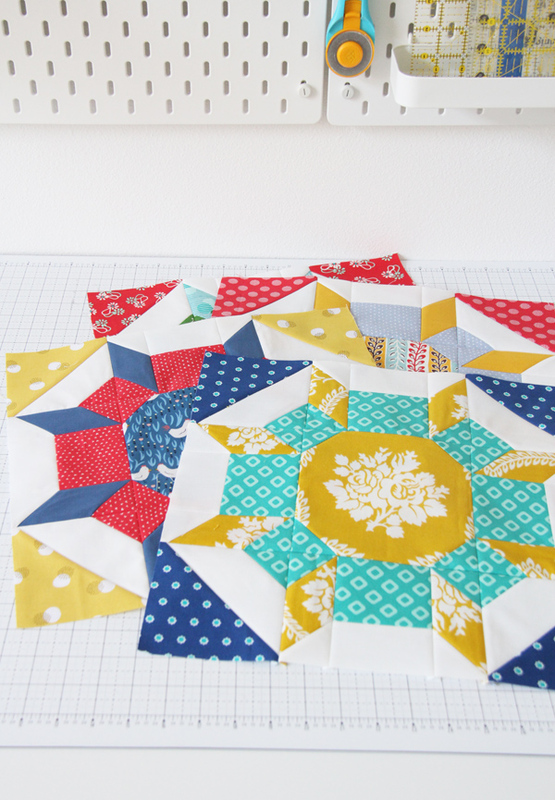 The pattern uses fat quarters, but in this version I used repeats of fat quarters since I was still working out the pattern. 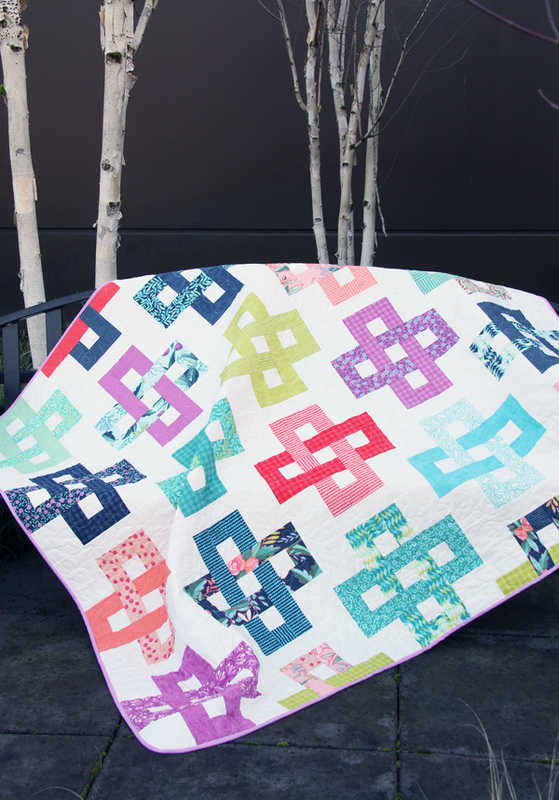 I knew this quilt would eventually be given to my 8 year old, so I let him help pick the colors and fabrics. Kathy quilted this for me and did an AMAZING job (imagine me clapping for you Kathy). 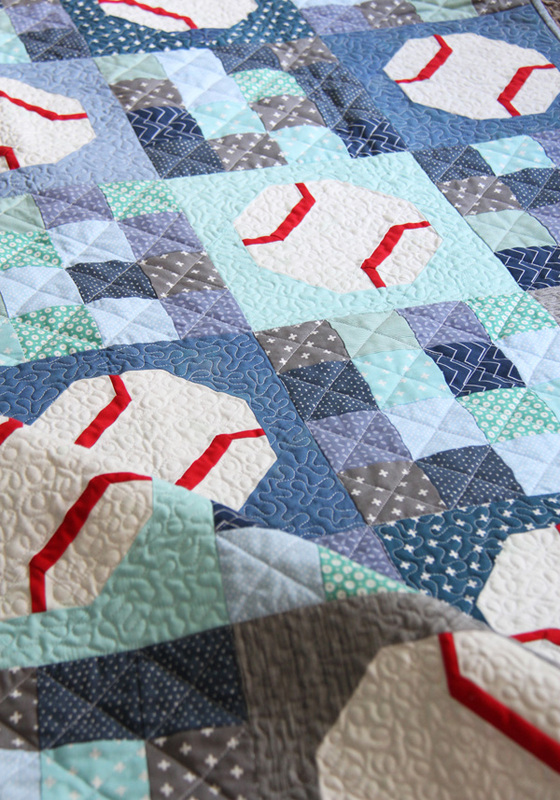 The baseballs and the crosshatch quilting in the 16 patch blocks is perfection. 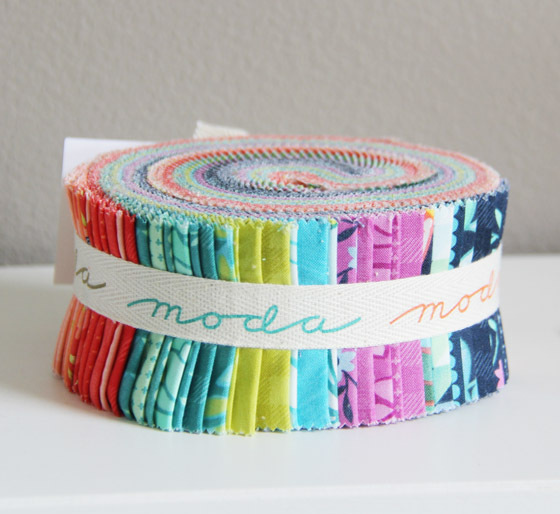 I put a soft flannel on the back of this one so it can be loved and used. 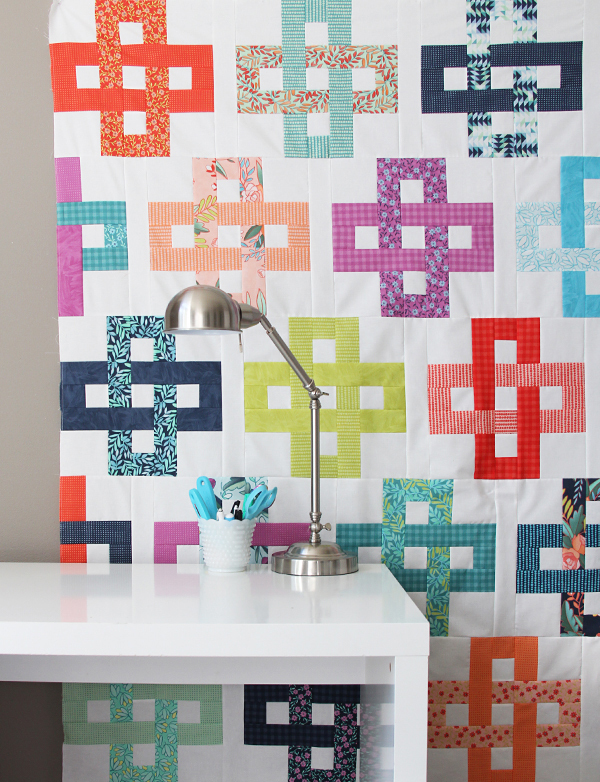 This pattern uses only simple piecing techniques, with no tricky seams, applique, or paper piecing. 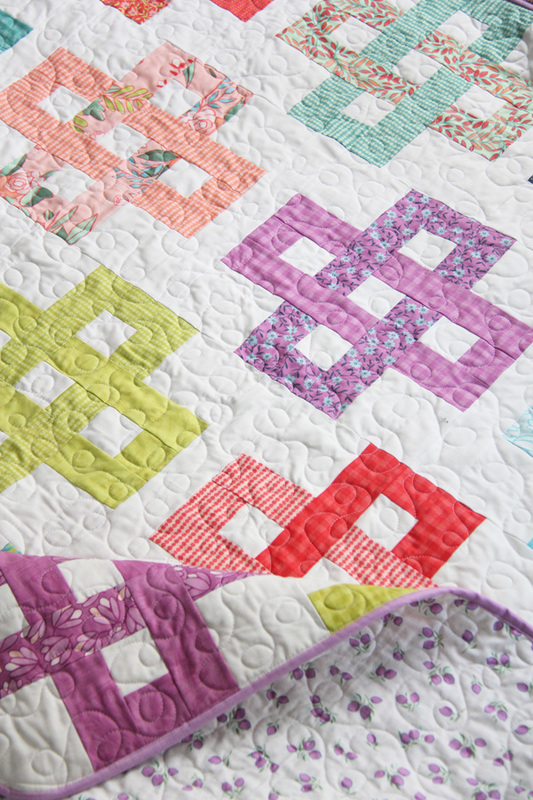 These blocks really do go together fast. 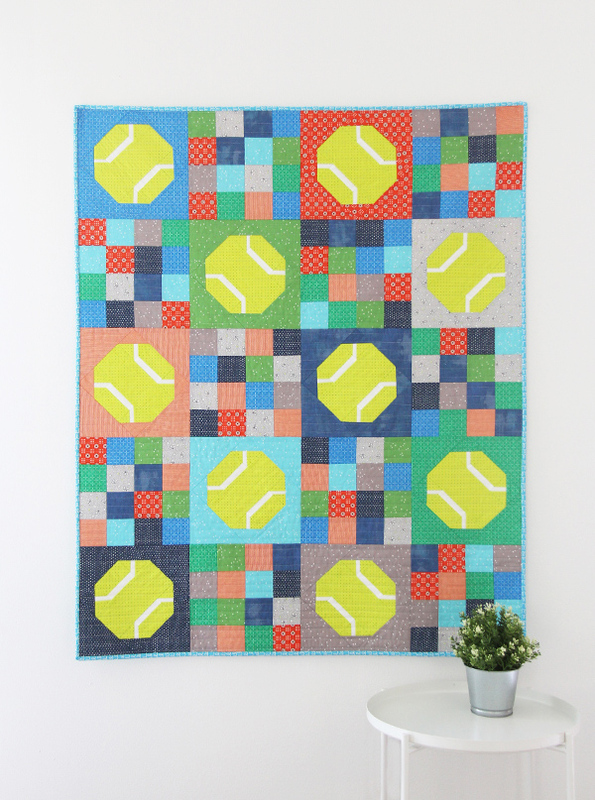 My favorite part of this pattern is that you can also use it to make a tennis quilt! 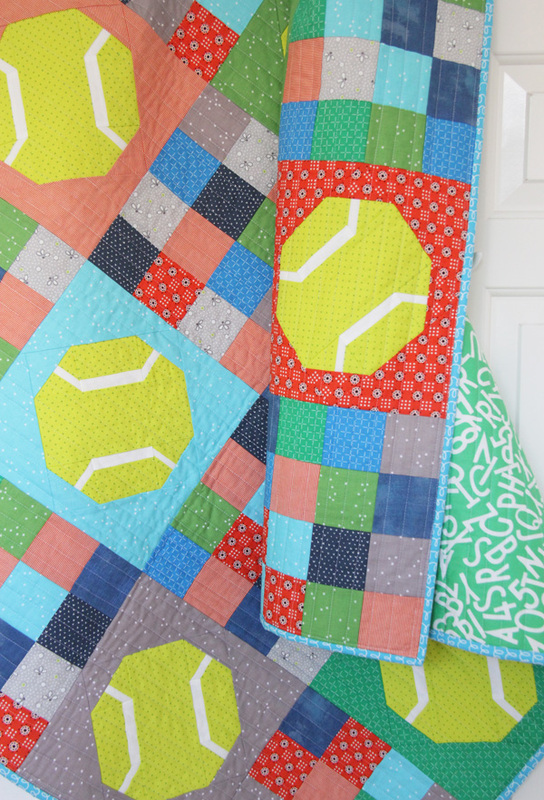 And I love tennis (more than baseball…shhhh). 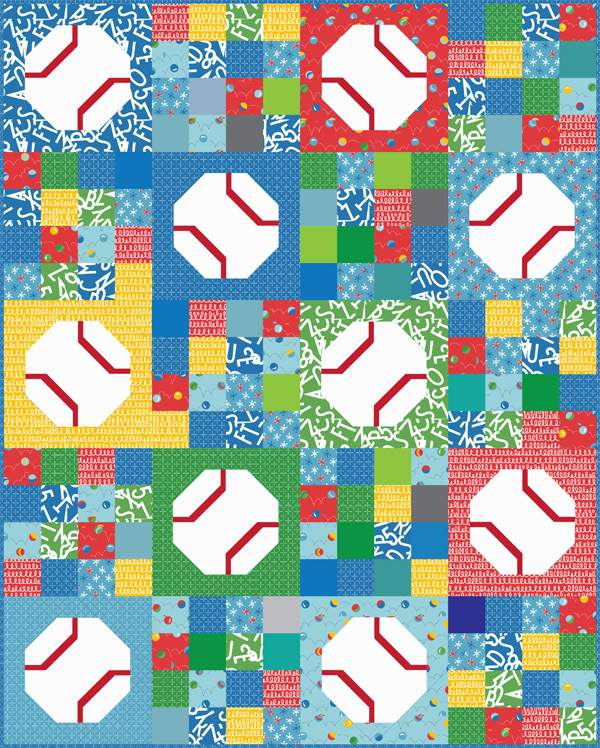 The Batter Up pattern can be found here as a PDF, or here as a Paper copy. Also if I’m missing from this blog for the next 3 months you’ll know I’m probably sitting on the bleachers, in the rain, on a baseball field somewhere eating my thousandth pretzel while watching my thousandth baseball game we were probably 10 minutes late to because someone couldn’t find their baseball glove/cleats/hat/pants/jersey or all of the above. It’s crazy and I love it.